It shouldn’t be a surprise because as human beings, joy is our natural state. We display our best and natural qualities when we are happy and have a true sense of joy in life. The challenge we face is this idea of “being happy” is elusive. We keep chasing external success or achievement because we think it will make us happy. It is not uncommon for people to pursue financial and career success but still not be fulfilled or happy. The better we’re able to understand what happiness means to us, the easier it will be for us to do the things that will allow us to experience joy and happiness. 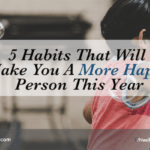 The good news is experiencing happiness on a consistent basis is often a lot easier than we think. Plus it may not cost as much as we think it does. At times, it will require us to make some difficult choices and do some things that may seem difficult initially. However, if we have a long-term objective in mind, any short-term discomfort will be well worth the reward in the long run. In my late 20s, I started learning more about myself through personal development training programs and one thing I became aware of was that I was filling any emptiness I was feeling in life by following many different sports. It was as if my level of happiness my life revolved around other people either winning or losing in sports. Mind you, I was not participating in any of the sports — I was merely a spectator. That was a true reflection of how I was living life. Instead of designing the life I wanted, I was drifting and hoping I would somehow magically experience happiness. A difficult decision I made at that time was to phase out most of the sports I watched and started using that time to educate myself. 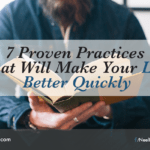 I started reading books, attending more seminars and training programs, and getting coaching in order to find out more about myself.That decision allowed me to dedicate time to things that were more valuable in the long run and it also helped me when I transitioned out of a corporate career to being a business owner. One of the consequences of that decision was that people I knew at the time were no longer a part of my life. They just naturally drifted away over time. That created the space for me to welcome in more like-minded, who I could relate to based on how I had developed myself. At the end of the day, being happy is a choice and sometimes we have to do some difficult things in order to experience the level of happiness we want. 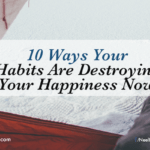 Here are ten things to consider doing that will support us in being happy now. Reflect back on times when you were truly happy in life. We’ve all experience true joy and happiness at some point in our lives. Most times, it would have been when we were really young. We will find that there would have been common themes during those experiences. It could have been with the people we were with or the activities we were carrying out. Those moments are clues as to what will bring us joy and happiness. Learn to be happy again. As we grow older, we become more “responsible” and start acting like how we think a responsible person should act. Our sense of fun and playfulness gets lost in our adulthood. 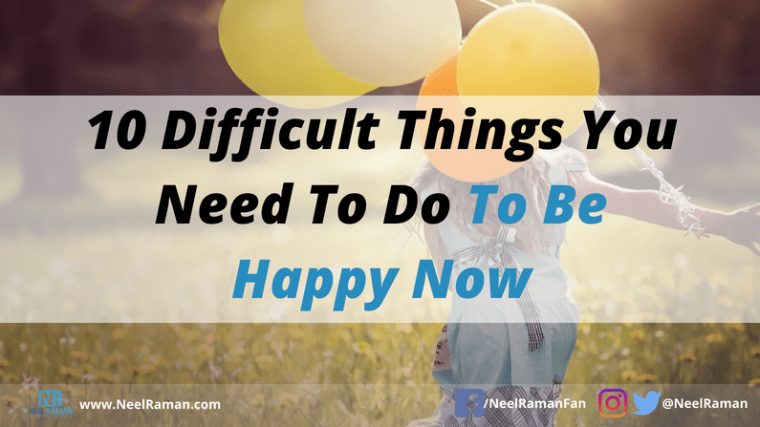 Therefore, we have to rediscover how to be happy again, which supports the previous point of reflecting back on those times when we were truly happy. Stop giving so much attention to other people’s opinions of you. What other people think of us is really none of our business. It is more beneficial to focus on what we can do and control. The energy we tend to waste wondering or worrying about other people will be better spent on doing the things we want to do. Focus on what’s important to you rather than what others are doing. Competitiveness can be a good thing but it can also result in wasted effort, time and energy if our intentions are wrong. Just because someone else achieved something, it does not mean we should also strive to achieve the same thing. This goes back to being clear on our true intentions and what happiness really means to us. Engage in activities that will challenge you. Sometime we just need variety in life, which gives us a break from our normal routines in life. That change can come in the form of new projects, new activities or even inviting in new people into our lives. We are more engaged when we’re doing something new that really excites and motivates us. The key is finding out what these activities are for us. Stop feeling sorry for yourself. There will be times when we don’t feel happy for any number of reasons. Rather than being the star of our own pity party, we must reflect back on what is causing us to feel unhappy. Most times, it will be because of the types of thoughts we are thinking. Therefore, if we start changing our thoughts, it will start generating new emotions. Find something worth fighting for in life. Unless we have a higher purpose or meaning for what we want our lives to be about, most the things we do will only bring us short term excitement. We have to find something in life that will make us feel like we’re actually contributing to the world in some way and making a difference. Be patient with yourself. At times, things will be difficult. That is the rhythm of life. We have to be willing to ride out those difficult times and come out with new found awareness and appreciation for life. We also have to be willing to make mistakes because those mistakes will give us perspective on what is and isn’t important to us. If we want to be happy, we have to make a choice to be happy. And at times, those choices may be difficult but they will be worth the effort if we are true to ourselves and what we want. Action Step: Over the next week, answer the following question, What does happiness look like to me? This will be the starting point for experiencing happiness more consistently, which will flow into other things you do. 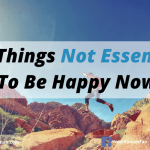 Question: What is another thing we can do to experience more happiness now?